Rocket Lab's first launch of 2019 is in the books. A Rocket Lab Electron booster lifts off from New Zealand on March 28, 2019, carrying the R3D2 satellite to orbit for the U.S. Defense Advanced Research Projects Agency. 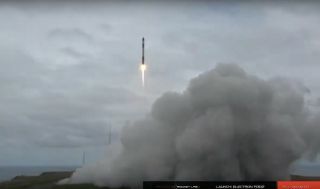 The spaceflight startup's Electron rocket rose off a pad on New Zealand's Māhia Peninsula today (March 28) at 7:27 p.m. EDT (2327 GMT; 12:27 p.m. local New Zealand time on March 29). About 53 minutes after liftoff, the booster delivered to orbit the 330-lb. (150 kilograms) Radio Frequency Risk Reduction Deployment Demonstration (R3D2) spacecraft, an experimental satellite that will be operated by the U.S. Defense Advanced Research Projects Agency (DARPA). The R3D2 mission "intends to space-qualify a prototype reflect array antenna to improve radio communications in small spacecraft," Rocket Lab representatives wrote in a mission description, which you can find here. "The R3D2 antenna, made of a tissue-thin Kapton membrane, packs tightly inside the small satellite for stowage during launch, before deploying to its full size of 2.25 meters [7.4 feet] in diameter once it reaches low-Earth orbit," they added. R3D2 was originally scheduled to launch in late February. But the liftoff was pushed to March 24 to give its builder, aerospace company Northrop Grumman, more time to complete tests and checks, a DARPA spokesperson said at the time. An issue with a video transmitter on the Electron and some bad weather then pushed the liftoff back further, until today. Today's launch was Rocket Lab's first since December, when an Electron lofted 13 tiny cubesats for NASA, and the company's fourth overall. That tally will grow quickly, if things go according to plan: Rocket Lab wants to fly a dozen times in 2019, company CEO Peter Beck said earlier this year. Further ramp-ups will likely follow. California-based Rocket Lab aims to greatly increase access to space with the 57-foot-tall (17 m) Electron, which can loft about 500 lbs. (227 kg) on each $5 million liftoff. Not all of those missions will originate from New Zealand. Rocket Lab is building a second launch site, known as Launch Complex-2 (LC-2), at the Mid-Atlantic Regional Spaceport on Wallops Island, Virginia. The first liftoff from LC-2 is scheduled to take place this fall. Editor's note: This story was updated at 8:42 p.m. EDT to state that R3D2 deployed successfully.